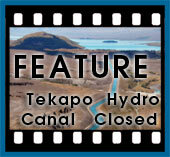 Activities for the visitor to Lake Tekapo and the Mackenzie. Scenic flights, hot pools, star gazing, astronomy tours, horse trekking, hunting, fishing, etc. On the summit of Mount John, high above Lake Tekapo, operates a scientific astronomy observatory. Earth and Sky conduct both day and night tours of the facility, including the operation of its own telescopes and a cafe on the very summit. Nestled into the base of Mount John, overlooking Lake Tekapo and the mountains beyond is the Tekapo Springs, and its Winter Park. Heated alpine water supplies four large, outdoor, public hot pools. A health spa, complete with massage facilities is a great way to lose stress. The 9 hole Cairns Golf Course originates at the stables - Le Stables - of the historic Mount John Station. Location: Departing nightly (clear nights) from the bus parking lot, just beyond the tavern. Description: Tekapo Starlight provides a guided tour of our beautiful Mackenzie High Country night sky. With your naked-eye and curiosity, explore the wonders of our Solar System, our Milky Way Galaxy, and far beyond. Join the adventure. Description: 5 different scenic flights with landings. Weddings, Hunting, Filming and Charters catered to your needs. Description: Tahr, chamois and deer roam the hills and mountains of the Mackenzie Country. Your hosts have access to some of the best hunting terrain in New Zealand. Description: Cross golf with rugby and you have golf cross. Instead of holes there are goals and the ball is still small, but is oval. Only 30 minutes from Tekapo and located on the shores of Lake Pukaki with spectacular views of Mt Cook (Aoraki), GolfCross is a great game for family and friends.